I thought this would be easier to list in one location so you don’t have to hunt under several different categories. 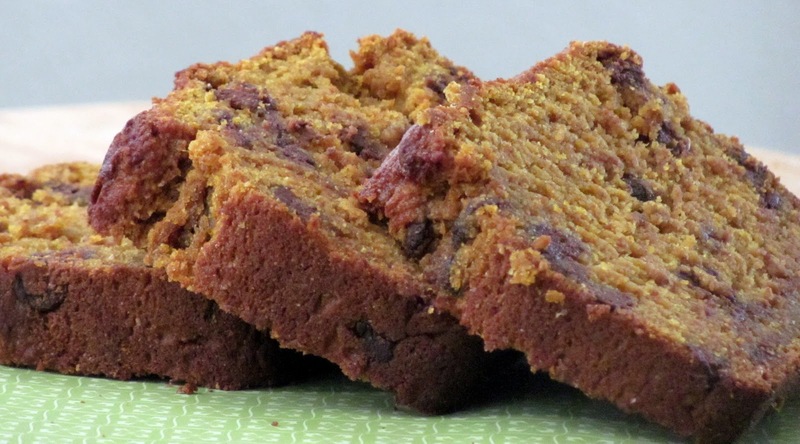 I have tasted good pumpkin bread in my time but I think this recipe is just fabulous. This bread is is very moist and flavorful. It seemed to me that it was even better the next day and better the day after that. 1. Preheat oven to 350 degrees F. Spray three 9×5 inch loaf pans with cooking spray and set aside. 2. In a medium bowl whisk together the flour, cinnamon, nutmeg, baking soda, and salt. Set aside. 3. In a large bowl, combine sugar, pumpkin, canola oil, water, vanilla, and eggs. Mix until smooth. 4. Slowly blend in flour mixture. Fold in chocolate chips. Evenly divide batter between the three loaf pans. 5. Bake for 60 minutes, or until browned and a toothpick comes out clean. Remove loaves from oven and cool in pans on a wire rack for 15 minutes. With a knife, go around the bread and loosen the loaves. Remove from pan and cool completely before slicing.